We have partnered with Outside Magazine and eleven incredible brands to give you first-class gear for your backpacking kit! Win over $1400 in prizes. There will be two winners, First and Second Place. Enter with your email address and first name, and earn many additional entries by sharing with your friends, following participating brands on Instagram, and completing our Backpacker Type survey! The giveaway will run from November 26 – November 30th. Is it bed? Is it a sleeping bag? The Backcountry Bed from Sierra Designs is a unique zipperless sleeping bag that feels like you’re sleeping right at home. You can use the cover-like fold to lock in warmth or get air on a spring night, and the foot opening allows for easy venting or wearing around camp. The Flex Capacitor by Sierra Designs is a shape-shifting ultralight backpack that morphs from 40-60 liters with an easy-to-use external compression system. The suspension is excellent, and the pack is built for highly organized people who want to go light. The Flex Capacitor won our Budget Pick for the Ultralight Backpacker. The Distance Carbon Z Trekkng Poles from Black Diamond are some of lightest weight ples on the market, at roughly 10 ounces per pair. They fold into a Z for easy storage, are made of carbon, and are crazy durable. Make sure you order in the right size, as they aren’t adjustable. If you haven’t tried Patagonia’s food-focused Provisions, you should. It takes ethically sourced camp food to an entirely new level. The Shareable Feast Box has just about everything they offer, and will stock any backpacker for a few trips. The salmon is our favorite! Therm-a-Rest is the go-to in sleeping pads, and the ProLite Plus is the most popular model among all outdoor folks. It self-inflates, isn’t too heavy, is highly durable, and provides a fantastic night’s sleep. It also rolls up easily for storage in or on a backpack. UCO Gear combines style and functionality into a formidable headlamp with the Vapor+. This headlamp has 300 lumens on high, uses a dial for easy adjustment, and has red LED options as well. The Vapor+ uses a removable Li-ion rechargeable battery pack and AAA capacity to handle any situation. It looks pretty sweet, too. Morakniv is known for knives, and the Eldris Knife Set is perfect for any backpacker. A tiny pocket-sized fixed blade, locking carrying case, necklace paracord strap, and included fire-starter all weigh about 3 ounces. The knife itself has a straight edge for fire starting, too. If you need a do-it-all knife that takes up no extra room, this is it. The Micro Squeeze from Sawyer is a lightly tweaked version of the incredibly popular (and award winning) Squeeze water filter. This is a squeeze-style filter that lasts up to 100,000 gallons using a Hollow Fiber Membrane, and the whole thing weighs two ounces. Never be without a water filter. 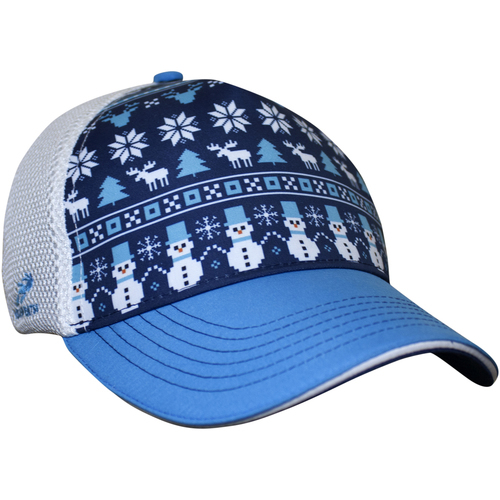 Headsweats knows hats, and the CHristmas Trucker Hat is a fun holiday take on their durable, sweat-catching design. You can’t go wrong with shade and snowflakes. Headsweats also makes beanies. The Snow Pom beanie will keep your noggin warm this winter, and we think it’s pretty stylish. It’s made with Eventure acrylic knit, and is machine washable (but air dry). Roam with the buffalo, and get outside. FITS makes fantastic socks — and yes, they fit. This Light Hiker Teton will get you from the brewery to the mountains with ease, and they will take a lot of abuse before stinking. MPOWERD is all about solar lanterns, and the Luci Pro Outdoor 2.0 is a rockstar. It has a strap for easy attachment, is waterproof, and collapses down to an inch when not in use — and you can still charge it when collapsed! A fantastic light for the backcountry. HydraPak makes soft water containers — bladders, bottles, storage, you name it. The new Stow is flexible, has a spill-proof nozzle, and a handle for easy carrying and storage. At only two ounces it’s way lighter than a hard bottle, and can fit anywhere in your pack. Feel a blister coming on? Use Sawyer’s Blist-O-Ban. The unique design is made to fit around a growing (or already formed) blister, and uses a patented dome design to re-route any friction on sensitive areas. Put it in your pack, then on your foot.